Mad Catz has taken peripheral customization to a whole new level with its R.A.T line. Sure, some other manufacturers might let you tweak the LED lighting, or add some extra weight, or even switch out the thumb grip, but the R.A.T. Pro X introduced earlier this year went way beyond that. 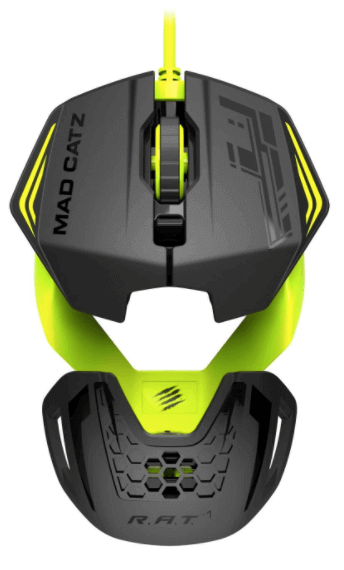 The new Mad Catz R.AT 1 isn’t quite so transformer-like, but its product shot still looks like an exploded diagram. 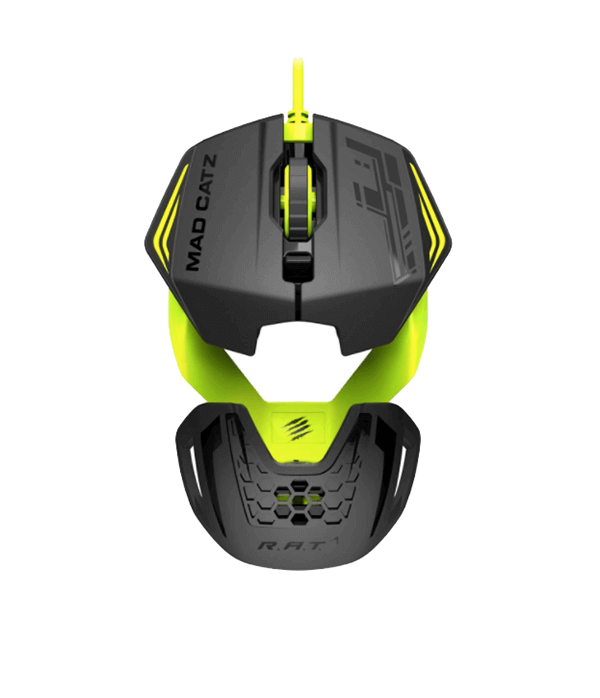 Split into three distinct sections, the Mad Catz RAT 1 lets you take apart the palm rest, chassis and sensor module, with the idea being that they can be interchanged with alternatives. Unfortunately, there aren’t any alternatives you can buy right now, but it seems likely Mad Catz will make some available in the future. What you can do when you buy it, though, is make your own. In an unprecedented move for a manufacturer of almost anything, Mad Catz has released the 3D CAD modelling files for the palm rest, letting you 3D print your own with your own designs if you have the facility to do so, or pay for one to be made for you at a commercial outlet. Although somewhat of a roundabout process, this is a level of customization that offered by few. The only mouse we can think of that exceeds it is the Roccat Nyth. You can remove the core sensor module from the palm rest, as well, which lets you use it as a travel mouse if needed. 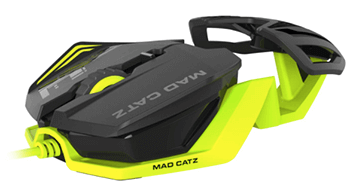 It won’t have quite the same features as the full sized RAT 1, but if space is a premium, this mouse can conform to it.Other than its swappable modules, the new Mad Catz mouse packs a high quality, 3,500 DPI Pixart PMW 3320 optical sensor under the hood, for precision gaming, a grilled palm rest to keep perspiration to a minimum, a glow in the dark frame (or a white and red alternative) and scroll wheel, and a mouse cable protector to make sure it doesn’t shear off somewhere down the road. I’ve owned this mouse for about a month. If you’re looking into this particular model, it must be because of the design of the device. The actual mouse itself is about six centimeters by eight centimeters and features the left and right mouse buttons, a scroll wheel, and a central knob that can be shifted up and down. The rest of the mouse is a plastic frame with a plastic palm rest. So, when looking at the device, I gave it five stars because the mouse does exactly what MadCatz intended for it to do. This is a quality mouse made to look different, work well, can be used for gaming, and comes with layouts for 3D printers to make a palm rest. I played through Half Life 2 on this mouse, because it’s Half-Life 2. The RAT. 1 functions as well as any mouse made in that day, except that the weight is very light, as to be expected. This does take a day or two to adjust to, and works perfectly fine, as any mouse should. When adjusting to the weight and feel of the mouse the Carbine was demolished in no time. What this is NOT, is an EXTREME GAMING mouse. You won’t find multiple sensitivities on the sensor, memory for multiple profiles, a group of buttons made for macros, or a sensitivity kill switch. This mouse is made to be simpler and has enough buttons to do what you need. So, please don’t judge the mouse for what it is not designed to do. The Mad Catz RAT 1 is plug and play with additional drivers and software that is available on MadCatz’s official webpage. The software installation requires either the 32 or 64 bit version of .NET Runtime 2.5. Once the software is installed, you can then map any button or shortcut for six of the seven different inputs, the left mouse button will always be the left mouse button. You can also create your own macros if you want. Everything is software based, so nothing is stored on the mouse to swap between devices. But, being practical, the knob under the mouse wheel can be set for ‘forward’ and ‘back’, meeting the basic mouse-like requirements. This mouse, I would recommend for all gamers, except for those who are actually in the professional competitive scene. Those kinds of gamers need the profiles, sensitivity settings, and macros to compete. With that group excluded, that means the mouse is great for the 99% of gamers who don’t professionally compete.